Cattle stress can completely undo all the hard work of finishing cattle for slaughter. While microscopic fat cells in meat are responsible for tenderness and flavor (Rules 1, 2, and 3) of the Seven Rules of Producing Great Beef, meat can also become tough and flavorless through the effects of stress. Stress causes muscle fibers to tense up and triggers a cascade of changes in the body chemistry of the beef animal. Cattle stress makes meat tough and flavorless. What does adrenaline do and how does it affect beef? Adrenaline also increases the animal’s alertness to make it more aware of its surroundings and to kick-start it out of drowsiness or laziness. But obviously, tense muscles and hyper-alertness (nervousness) are NOT a recipe for tender flavorful beef. A release of adrenaline triggers a change in the pH (the acidity) of the meat. Muscle tension triggered by adrenaline (stress) is not the same as simply tensing a muscle when it is being worked. Working a muscle allows the tension to disappear as soon as the muscle relaxes again. But stress-induced tension doesn’t disappear just because the muscles stop working. Stress causes a chemical response that is designed to ‘prepare’ the muscle for action. And those chemicals don’t just disappear the moment the threat or discomfort goes away. The body actually has to break down those chemicals and expel them from the body through the vital organs. Think of your own body’s response after an extremely bad scare that produces a rush of adrenaline. Not only do your muscles often feel tense for a long time afterwards, but it is also common to have muscle shakes and emotional instability afterwards, as well as experiencing aching kidneys or lower back pain afterwards as the body breaks down these chemicals in order to remove them through the kidney or liver. And you're likely to remain jumpy and more alert than usual for days or even weeks afterwards. And situations that remind you of whatever produced that scare can trigger a fresh adrenaline rush even years afterwards. In other words, fear and the adrenaline that goes with it actually causes a wide range of side-effects that persist long after the initial stress is gone. Adrenaline produced by cattle stress does not go away like the flick of a switch. It takes time to fade and (as the back pain example above illustrates) the breakdown and removal of adrenaline is in itself a stressful process for the body. It is no surprise then that a tense muscle caused by cattle stress will result in tough meat. When cattle stress is short-term, temporary changes in chemistry within the meat make the beef tough and causes it to lose flavor. But if stress persists for an extended period of time, the changes are even worse. The persistent high acidity in the meat caused by long-term cattle stress will actually begin breaking down the meat, almost as if the body is digesting itself. The meat becomes dark, soft, mushy and sticky, very similar to bruised meat, and will have a very limited shelf life. In the industry, these type of cattle are called "dark cutters." Yuck. Unlike short-term stress, beef affected by long-term cattle stress is no longer tough. Quite the contrary - it's even more tender. But don't think that this is a good thing. The appearance, texture, and short shelf life means that the meat from most dark cutters simply goes in the waste bin - a complete loss. Long-term stress is also hard on the cattle's vital organs like the liver and kidney, which have to process these fairly aggressive chemicals and expel the waste products. There are lots of different types of cattle stress - but they all trigger adrenaline! Reviewing this list illustrates the wide range of important considerations that must be addressed when designing a grass-finishing program. And these are by no means the only things that can cause cattle stress! Part of the job description of anyone managing a grass-finishing program to constantly look out for things that could cause cattle stress. Identify the potential stress source, tweak the system, and eliminate the problem before it causes stress. Beef tenderness and flavor depend on it. Finishing cattle for slaughter is not just about feeding cattle. Cattle stress reduction plays an equally important role as cattle nutrition! Happy cows = tender flavorful beef = happy customers = repeat sales = happy farmer! Skillful grass-finishing involves understanding cattle behavior, nutrition, cow psychology, social hierarchies, herd behavior, and the way cattle visually perceive the world. Designing your cattle finishing program means accounting for all these factors so they can work smoothly together. My book, Grass Fed Cattle: how to produce and market natural beef explores each of these factors in detail and teaches how to use low-stress handling techniques so you can minimize cattle stress in your beef production program. Cattle that need to wade through icy water, are plagued by flies or dust, or have to sleep in mud will not be happy cattle. They will eat less and experience unnecessary cattle stress. A well-managed pasture rotation that provides a fresh slice of grazing pasture every single day ensures that the cattle are always grazing the best grass available and are not exposed to dry, over-grazed, dusty pasture conditions. Designing a water system as part of the grazing rotation (see the Smart Electric Fence Grid) also ensures that the cattle have access to convenient water and are not sliding down steep banks, tiptoeing across boulders to reach a creek, or wading through mud around a poorly constructed water trough. A well-designed grass-finishing program ensures that there is a pre-planned strategy in place to remove injured or diseased animals from the herd and provide them with the necessary treatment. Typically this involves having an alley system that is accessible from any pasture within the grazing program to quickly and easily walk an animal to a corral for treatment, such as the alley shown in the example farm plan. This treatment protocol also typically involves having a ‘sick’ pen where injured or sick animals can recover to avoid spreading disease to the rest of the herd, and to ensure that there is minimal competition for food and water, and walking distances are minimized during the recovery to make to make healing as quick and painless as possible. But even more important is designing a strategy to prevent disease, injury, or pain from occurring in the first place. Quarantining sick animals in prepared sick pens prevents a wider spread of the disease. Designing gate systems, corrals, and handling protocols that avoid bunch-ups at gates will ensure cattle will not get injured or crushed during pasture moves though gates and alleys or when cattle must be rounded up in the corral for processing or transport. A good mineral supplementation program ensures maximal health and minimized cattle stress. Calving in the summer on green grass instead of calving in the midst of spring snow and mud ensures that cows calve easier and calf productivity is not compromised by disease pressures (which can cause long-term side-effects right through to the grass-finishing program (runtiness, poor gainers, or susceptible immune systems), quite apart from the fact that a calf born in a mud puddle and injected with antibiotics to cure scours will not be marketable as organic, and may not be allowed inside your grass-finishing program at all. A daily pasture rotation reduces fly and dust pressure, reducing pink eye and other disease pressures. Smoothing concrete edges at water troughs and designing smooth edges on mineral feeders prevent foot injuries, limping, and painful walks to drinking sites. And that’s just the tip of the iceberg... it is all about anticipating the indirect consequences of your management system and how it will affect your herd’s health and behaviour. Competition over resources can be extremely stressful for cattle. For example, if a water trough fails to refill quickly enough, a huge power struggle can develop around the water trough with a few dominant cattle controlling access while the whole herd jostles around the water trough all day to ensure they will get their drink. This is tremendously stressful, increases injuries and bruising, and exposes the cattle to increased disease pressures as flies hatch from the manure paddies accumulating around the water trough. This example of a resource scarcity is a particularly common and detrimental example that is discussed at length in the "Livestock Water" chapter of Grass-fed Cattle. Water is not the only limited resource that can trigger great cattle stress in your herd. Something as simple as shade or a windbreak can become a huge battleground for your cattle if it is not large enough to accommodate the entire herd. No shade is better than not enough. Cut the lone tree out of the middle of the paddock, or plant enough along the fence line so the cattle don’t need to fight over it. Even mineral or feed supplements can become a source of cattle stress if a few members of the herd can gorge on it and deny access to the rest. An unfamiliar environment (such as when cattle are sold on to a new farm), an unfamiliar routine (such as when daily pasture moves are shifted to a new time of day), unfamiliar handling practices or unfamiliar people (such as when new staff are involved in handling cattle or performing pasture moves), or new sights, sounds or smells outside of what the cattle are accustomed to all produce varying degrees of cattle stress. This is why a consistent grazing routine, consistent staff, consistent handling practices and consistent human behaviour styles, as well as a consistent herd structure (no mixing unfamiliar groups of cattle together just before slaughter) is so important to creating the stability, consistency and familiarity that allows cattle to remain calm and stress-free. Handling stress is a big source of cattle stress. Whooping and hollering, aggressive cattle dogs nipping at heels, cattle prods, over-pressuring flight zones, and failing to understand cow psychology all are stressful to cattle. Handlers need to learn how to handle cattle in a calm, consistent manner that meshes with the way cattle think. It is also important for handlers to be aware of their own attitudes and emotions around cattle. Just like an angry or irritable milking parlor employee can sour the entire dairy herd’s milk with his presence, an emotionally upset or irritable person around your grass-fed beef herd will stress out the entire grass-finishing herd and will reduce the tenderness and flavor of your beef. Rodeo attitudes, negative emotions and impatient or irritable people do not belong anywhere near your cattle herd. If you’re in a bad mood, go take a walk and calm down before you go anywhere near your cattle. Not only are you going to save yourself time by keeping the cattle calm, but your customers will thank you for it later too. 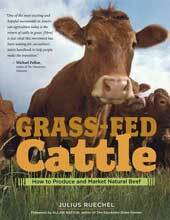 For more about learning how to handle cattle, read the "Managing Your Herd" chapter of Grass-fed Cattle to learn low-stress handling strategies and understand more about cow psychology. Social stresses in a cattle herd can be huge. Their impact is grossly underestimated on meat quality. Cattle are very social and hierarchical creatures. Hierarchies take a long time to establish and the jostling for position is quite stressful in a herd. So, once you have a grass-finishing herd established, you do not want to introduce new animals at the last minute, or split or regroup your animals in the final weeks before the slaughter date. Multi-generational herds are always calmer than herds amalgamated from lots of different farms (new cattle added to an established herd can spend years grazing along the periphery of the herd before they become truly integrated). Isolation from a herd is also very stressful. Cattle depend on their herd for a sense of security. Removing them from their herd is very stressful, which is why isolating a steer from the grazing herd a few days before sending them to slaughter will cause a great deal of stress for that animal and will undermine any ‘special’ last minute feeding regimes that you are providing for him in preparation for slaughter. Sorting cattle from their herd on the day they are meant to go to slaughter is best way to minimize isolation stress prior to slaughter. And fear is contagious. Nervous cattle infect one another. A calm herd will calm new additions to the herd. But a nervous individual will infect the entire groups - if it doesn’t calm down, it should be removed from the herd and perhaps even sold at auction since it won’t likely be calm enough to make good beef anyway. Fear releases pheromones that cattle can smell. The smell or sight of blood won’t bother them. But if an animal was stressed or fearful in a loading chute, squeeze, or on the slaughterhouse kill floor, their smell of fear will frighten other cattle that enter that area even days or weeks later. Fear pheromones are not easy to wash away and may require giving the entire squeeze area a good scrub with soap to stop the fear contagion. Butchering cattle typically means they need to be transported to the slaughterhouse by truck or trailer. This is where an inordinate number of things can induce last-minute cattle stress unless they are very carefully managed by the farmer. Nervous people concerned about deadlines can destroy all the calm that is vital during loading. Cattle prods, clanging gates and friction between handlers all need to be avoided on a day that is typically already stressful enough because of all the logistics and deadlines that need to be met. And then there is the ride. Hitting potholes, cornering too sharply, braking to sharply, packing the cattle too tightly in the trailer, packing the cattle too loosely in the trailer so they cannot lean on one another during corners, rattling gates inside the trailer, failing to close ventilation gaps in the trailer during icy weather, failing to provide ventilation gaps in the trailer during hot weather, too many hours without feed or water during travel, excessively long distances traveled to reach a slaughterhouse, or impatient handlers at the destination can all cause extreme last-minute cattle stress that will completely undermine the tenderness and flavor achieved during the finishing process. A bad trip in a trailer will turn the most tender filet mignon into shoe leather. Loud noises not only startle cattle, but with those big ears, they are quite painful too. Corral gates or squeezes that only sound mildly irritating to us may actually cause sharp pain and be very frightening to your cattle. A can of used motor oil to grease hinges and some foam and duct tape can work wonders to calm cattle while you are handling them or loading them for transport. And remember, cattle have long memories. A stressful, noisy experience in the corral a few weeks ago will cause them to be stressed as soon as you bring them back to the corral, before you have even begun handling them again. Last month’s temper outburst when you slammed your thumb in a gate during weighing may well cost you dearly this month while loading on the way to the slaughterhouse. Bright lights and reflections in a corral or loading chute can also be very scary for cattle because they create unfamiliar shapes and shadows, or blind them, preventing them from being able to identify whether the path ahead is safe. Small surprise then, when they balk. To further raise cattle stress levels, this is typically followed by someone starting to shout while prodding them with an electric cattle prod to get them moving again. Fix the cause of the balking and everyone can remain calm. Block a bright window or park a truck to shade a corral alley if cattle have to walk towards the sun. If your corral squeeze faces directly into the setting sun, don’t be surprised if the cattle refuse to enter the squeeze in the later half of the day if the workday stretches into the evening. Unfamiliar shapes and smells in a corral can also cause a lot of cattle stress. While you might like your new perfume, it could well be scaring the life out of your cattle and offending their nostrils because they don’t perceive smells quite the same way. Or, a jacket hung over a fence, or a shadow of a person moving back and forth across a gap in a fence may well cause considerable anxiety among your cattle. Remember, cattle have eyes on either side of their head, not in the front like we do, so they only have 2-dimensional vision that makes it much harder to identify shapes, sizes and shadows. One small slip up on your part (a crashing gate, a temper outburst, or a sudden movement by a handler that scares the herd) does not need to ruin the entire handling day if you take a few minutes to let everyone, especially the cattle, calm down again. But unless these issues are recognized and addressed, they will quickly add up to taint your best grass-finishing efforts. A well-designed corral and fence system, a solid understanding of cow psychology, flight zones, pressure tactics, and low-stress handling practices are an absolute must when handling your grass-finished cattle. Adrenaline is released when we get excited. 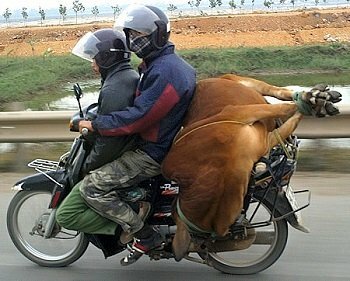 A revving motorbike or ATV triggers adrenaline in both farmer and cattle, creating a general air of excitement, which unfortunately destroys the calm and causes cattle stress. But excitement can also be of the happiest sort and still be detrimental. Opening a gate into a fresh pasture and letting the cattle rush in can cause an air of euphoria as the cattle rush though, kicking their heals in the air in celebration of the fresh grass. But adrenaline is adrenaline, no matter where it is from. Excitable cattle will not be as tender as calm happy cattle. Train the cattle to walk calmly through gates by teaching them to follow behind a mineral feeder or walking person. Calm cattle walk as slowly as your grandmother. Walking faster triggers excitement and adrenaline, and reduces the cattle’s ability to think through situations in order to react calmly, just like driving at 30 km per hour lets you think through reactions and stay calm, but at 120 km/hr anything unexpected that lurches out in the road in front of you is bound to trigger a burst of adrenaline and a reaction that may be quite devastating if you turn the wheel the wrong way. Anything that happens at 120 km/hr is unlikely to leave you calm. Grandma’s walking pace is cattle’s comfortable walking pace. Your regular, normal walking pace feels like 120 km/hr to a cow. And, last but not least, nutritional stress can be a significant source of cattle stress. In fact, it is so important that it is dealt with separately as Rule # 5 of the Seven Rules of Producing Great Beef. Rule # 1 of the Seven Rules of Producing Great Beef - Microscopic fat cells within the muscle fibers makes meat tender. Rule # 2 of the Seven Rules of Producing Great Beef - gauging the correct finishing weight when raising cattle on pasture. Rule # 3 of the Seven Rules of Producing Great Beef- ensuring consistent daily cattle weight gains in your grass finishing program. The Devastating Beef Changes Unleashed by Cattle Stress - understanding this chain-of-events is the key to building a better cattle finishing program.